We are just few hours from the official starting of the FSCA-PISA workshop on ComDev. It is night and I’m almost closing my laptop after having prepared the latest documents for tomorrow. This afternoon, during “day 0“, the first important goal was achieved: the Social Reporting Team met to discuss our activities and share the tasks. We decided to go for pictures, podcasting and blog posts. Video is a possibility but we have to find time and support for that. 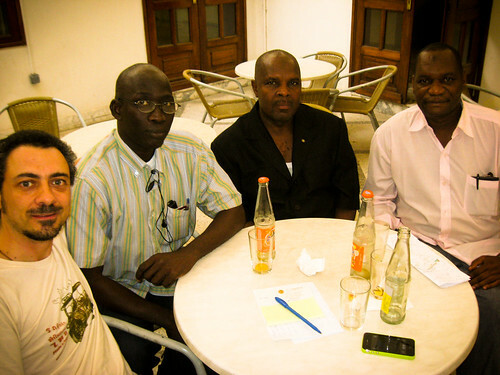 As you can see in the picture, the Team is officially (and initially) composed by Oumar Ndiaye (Senegal), Thierno Souleymane Bah (Guinee), Mamadu Aliu Djalo (Guinee-Bissau) and myself. Follow us and you’ll have a great experience! Categories: events, news | Tags: Africa, agriculture, capacity building, comdev, communication for development, dakar, facilitation, FAO, FSCA, km, knowledge management, participation, people, senegal, social media, social reporting, Social Reporting Team, support, talk share, team building, tools, training, web, workshop | Permalink.